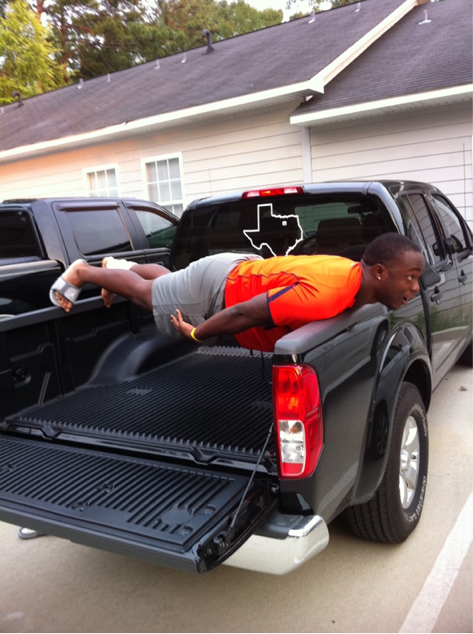 Texpatriates Emory Blake and Nosa Eguae seem to have walked the plank of planking sooner than most of their teammates (or at that’s what we’re writing until someone tweets us a photo of Lutzenkirchen stiff-boarding it in high school or something). From everything we know of the fad art form, Eguae’s execution seems flawless (and with a much higher degree of difficulty than Florida defensive end Lyden Trail), and his choice of apparatus truly inspired. For his part, Blake framed the shot perfectly, and is promising a “#PlankingSurge” today. So THAT’S what Reggie Brown was doing! With a li’l help from his bud Junior Rosegreen.